Use your engines coolant system to heat water for showers etc. 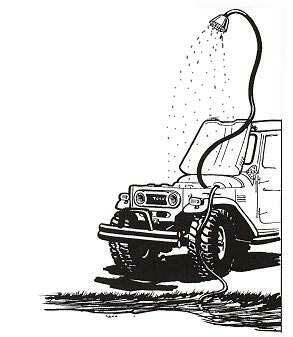 All you need is a vehicle with a water cooled engine and a water source (lake, stream or even a bucket) for an UNLMITED HOT SHOWER. With the REMOTE ACCESSORY KIT, you don't even need to open the hood. All you do is connect the suction and shower hoses to the installed bracket using the quick connect fittings, turn on the pump switch and you have hot water. Compact heat exchanger measures 2 .5" by 12"